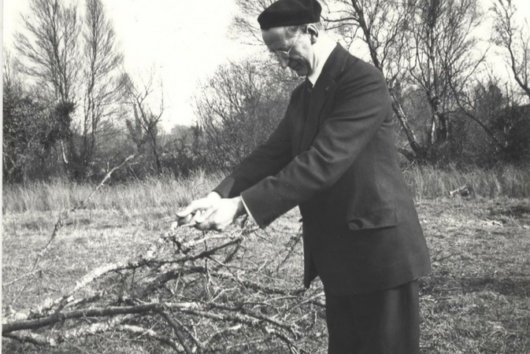 When Todd Andrews took charge of the Turf Development Board in 1934, Eamon de Valera made sure to inform Andrews of the importance which he personally attached to the development of the bogs. He also assured Andrews that he would always be available to help with any problems he encountered. Dev was deeply interested in the progress of bog development and took pains to make his support known in public. Year after year from the beginning of the scheme he visited the bogs every Good Friday. Frank Aiken usually tagged along as he was even more interested in the success of the scheme. There was a picnic lunch on those occasions and Andrews and the other Board members tried to get Dev to drink a bottle of beer as proof of his assertion that he was not a teetotaller. On the bog visits Dev made a point of greeting the staff at all levels and discussed issues with them. During the war Dev toured the bog areas of the west in support of the Emergency turf campaign. If you would like to be notified of when we post our blog, please enter your email address in the bottom right hand side of the page. I seem to be the only person on earth with an interest in Barna bog. It has been used by Munster Joinery as a rubbish dump estimated at 40,000 tons. It became a political issue when the cleanup started and was stopped after the 2011 election. I always wanted to see part of it returned to wetland and its easy because the trenches are there, they just need flooding and let nature take over. Almost 1000 acres abandoned, it needs managing but time is not on my side now. My name is Tony McKenna and I grew up working on the bog, helping to cut our turf every year. I’m from Newbridge, Co. Kildare and joined Bord na Móna in 1973. Part of my career here was spent in our Technical Information Office,but the last decade I’ve been part of the Communications Department. I look after the company’s archive material, mainly technical publications, historical data and old photographs. My hobbies are history, reading, DIY, gardening, running and also supporting Sarsfields GAA club and of course the Kildare GAA team.